Ach An Darach is a stunning property located in the crofting township of Teavarran near Inverness in the Scottish Highlands. The house sits in decrofted grounds of approximately 0.29 hectares (0.74 acres) and the croft land extends to approximately 4.58 hectares (11.3 acres) offering arable land used for grazing sheep and silage, together with an area of rough grazing and amenity woodland. The site and land were purchased by the current owner in 2012 and the property build was completed in 2014. The design of the house was heavily influenced by the owners to create a comfortable and practical home of the highest quality, taking advantage of the stunning views over its own land to Strathglass, Strath Cannich and Ben Wyvis. The house, which presents exceptional accommodation, is also highly energy efficient with income generating solar panels, insulation throughout, two wood burning stoves and an air source heat pump for the hot water. Built with comfort and energy efficiency in mind and set in beautifully presented grounds, Ach An Darach is a home for those who long for a better quality of life as it offers an ideal smallholding opportunity. The property has panoramic views over wooded farmland to the mountains of the west and yet is just a half hour drive from Inverness and 45 minutes from its airport. In addition, professionally designed gardens, including a productive kitchen garden with Hartley Botanic greenhouse, create a delightful setting for the house. The well managed and improved croft land at Ach An Darach has woodland and a burn on its far boundary and offers the opportunity to graze livestock or run a smallholding. The modern general purpose shed currently houses machinery and has the potential for conversion to stabling or livestock accommodation. Ach An Darach really does offer the way of life of most people’s dreams and is sure to attract a lot of interest. 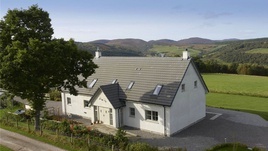 For sale through Galbraith at offers Over £595,000.